When a group from work, Body Kinetics Health Club in Marin County, CA, suggested running in the Marin County Half Marathon (or 10k or 5k), together as a team, I realized I hadn’t run in 20 years, since I was in my 40’s. I thought, “Well, I can certainly walk a 5k (3.1 miles) so I signed up. Before that, the only cardio I’d been doing was spin once a week, and a workout class once a week that included a cardio component. Otherwise, I was mainly strength training 2 to 3 times per week. Whenever I was required to do a jog in a class setting, like around the room a few times, I’d be dying, out of breath. My husband, Jeff, signed up with me and a couple months before the race we began slogging (a very slow jog) 5 minutes and walking 5 minutes. We had a 1.8 mile flat loop. We did this twice a week and graduated to 5 minute slog, 1 minute walk. Eventually we were slogging the whole way. Then we changed our route to a 1.6 mile loop with a long, steep hill built in. I had to do a heart rate check at the top each time because I was worried about overexerting myself, I was gasping that hard, but I never reached my max heart rate, I just reached my max pain threshhold! Initially, I had to walk on the downhill because it hurt my knees, but I worked on form, sitting back more in my stride going downhill. We got stronger. After about 6 weeks of this, I did a trial 3 mile run on the track and was pleasantly surprised that my time wasn’t too bad (12 minute pace) and I actually jogged the whole time. On race day I was so excited. Right out of the shoot, I was panting. I couldn’t figure out why it was so much harder than the day at the track. I figured it out afterwards when I realized I finished the race with a pace of 10:09, so much faster than my practice run. Turns out I was second in the ages 60-69 women category, fifth in 60-69 men/women. I finished 99th overall out of 371 runners. Ok, it wasn’t a race with a bunch of elite runners, but I was so blown away and proud of my performance. Most of all, being able to run so well is a testimony of the benefits of strength training. What I didn’t have in cardio conditioning, I made up for with leg power. My husband and I are continuing to run once per week. Who knows, maybe I’ll be like Harriette Thompson who ran her first marathon at age 76 (see post below)! Posted in Aging well, Inspiration, Movement...exercises, Uncategorized and tagged Aerobic fitness, Cardio fitness, exercise, fit seniors, running, Strength training. Bookmark the permalink. The power of daily practice. Here’s another inspirational video from the Give It 100 (giveit100.com) website. This young woman started with a poor body image feeling week and ashamed of her scrawny body. Watch this time lapse video is see where she is a 100 days later. Ok. The woman is YOUNG, but I’m not and I’ve experienced impressive changes to my strength. If you ask me, I’ll show you my muscles, too! Since Halloween, 2013, when I began a weight/strength training program, my body image has changed. Whether I’m at the ATM at twilight (better not mess with me! ), lifting something at home, holding myself upright in better posture, I feel STRONG. This is just from a steady, progressive, weight training program practiced regularly twice a week in addition to my regular cardio or other gym workouts. You can, too, in just 100 days! Posted in Aging well, Inspiration, Movement...exercises, Uncategorized and tagged exercise, exercise set, fit seniors, inspiration, progressive strength exercises, pumping iron, Strength training, weight training. Bookmark the permalink. If you don’t know who Dr. Metzl is you should find out about him. 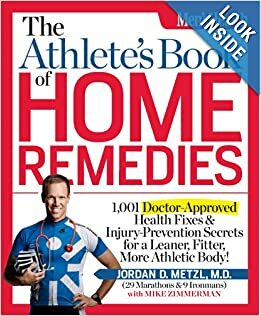 His book, The Athlete’s Book of Home Remedies: 1,001 Doctor-Approved Health Fixes and Injury-Prevention Secrets for a Leaner, Fitter, More Athletic Body! expounds on his belief that humans are meant to move. Every day. Even (safely) through injuries. He explains how strength training will prevent injuries and enhance athletic performance. This video with Dr. Metzl and 81 year old marathoner Elaine Breiger pretty much sums up his philosophy! Prepare to get inspired! Posted in Aging well, Inspiration, Uncategorized and tagged fit seniors, inspiration, weight training. Bookmark the permalink. Are You Ready to Get Fit for the Rest of Your Life? 71 year old Fred was. What a difference 30 days can make! Fred went to a boot camp for 30 days, changed his diet, his exercise, and his pants size. Maybe you can’t go away for 30 days, but you can start now. Decide to exercise every day. Just make a commitment. The rest will follow if you put yourself out there. Watch Fred and get inspired. Posted in Inspiration, Uncategorized and tagged fit seniors, inspiration. Bookmark the permalink. Yoko Ono turns 80 and she’s made a music video with some of her famous neighbors. “I’m a Bad Dancer” shows her busting a groove in less than sprightly moves with no apologies. You go girl. Gotta keep moving! Posted in Aging well, Inspiration, Uncategorized. Bookmark the permalink.